I don’t know about you, but there is nothing worse than that “OH NO!” sinking feeling when you realize that you, or someone else, has clogged the toilet! The usual option is to get the plunger and start the absolutely gagworthy task of trying to plunge the mess. Sometimes it works, sometimes it doesn’t, but you are always left with the gross plunger that needs to be cleaned and disinfected. Just thinking about it makes me cringe. 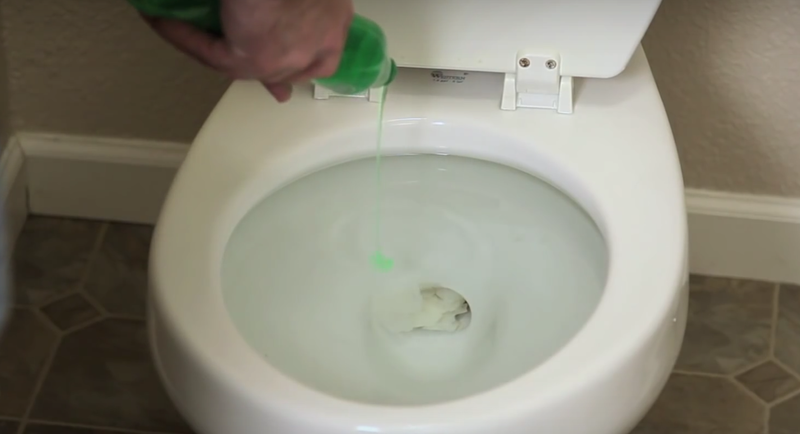 When I came upon this “NO PLUNGER” solution offered in the video you are about to watch below, offered by Build.com, I had to share it! The answer? Liquid dishwashing soap. Really. That’s it. Apparently, it works about 90 percent of the time. It only requires a little bit of patience and a bucket of hot water.